Gary from Snuff Mill Garage in Sheffield sent us some photos of a Nissan Micra he tested which shows how not to fit a towbar. In Gary’s words “A brilliant piece of work showing someone's home made towbar fitting skills and there's no reinforcement in the boot floor”. There are many different manufacturers of towbars. Designs can vary even for the same make and model of a vehicle. From 1 August 1988 type approved towbars can only be fitted to passenger vehicles up to 3500kgs if the vehicle has been type approved. However, type approval doesn’t apply to privately imported vehicles from outside of the European Economic Community. Most manufacturers will offer a fitting service, but fitting can be done independently if the installation is carried out to the manufacturer’s instructions. In this case the towbar doesn’t appear to have been originally made for this vehicle. The mounting brackets are the wrong size and shape which will eventually lead to the failure of the attachments. 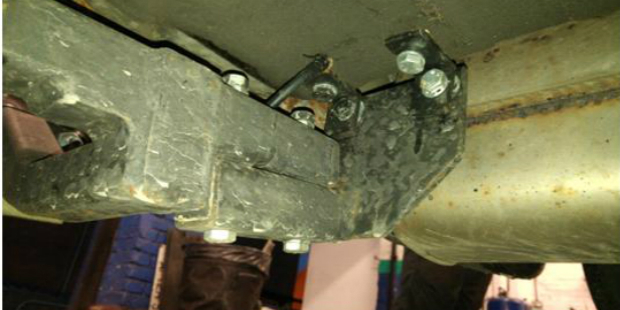 Failure of a towbar has serious road safety implications. At best, it could result in a sizable piece of metal being left in the carriageway - or worse a detached trailer. Now we are to train ourselves with cessation of the training sites with apparently 3hours a year the standard of testing will only suffer. I totaly aggree, i this is another cost cutting excecise, i enjoyed my five year training, the scheme is falling to pieces, there gets to appoint when you cant improve things, i think this is a bad move. So is this a failure or not , we are not structural engineers ,as said its not insecure and minimum standard applies that is until DVSA get involved after an accident has occurred then maximum standard is applied and the tester is left on his own !!!!!!!!!! Assessing a component's security and the effectiveness of any fixings is often difficult. Particularly if there is no evidence of movement or the fixings and associated structure are not clearly visible, in such cases 'pass and advise' is the appropriate cause of action. 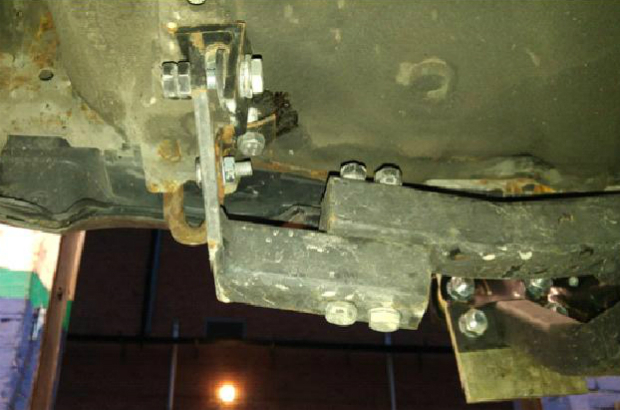 In this case the photograph shows that the brackets attaching the towbar to the vehicle's structure do not adequately support the assembly, either because they were not designed for this application or due incorrect fitment. Therefore it would not be unreasonable to fail this installation, not for security (RfR 6.6 1) but under RfR 6.6 2 for the mountings being of an inappropriate size and type. 6.6 2 - Towbar assembly is attached to the vehicle structure using a mounting, support or fixing which is obviously of an inappropriate size or type. Great, unreasonable that really answers my question ! If you can't say it's a pass or a fail then how can we. If this was failed and then had an appeal against it are you saying it could also be passed and advised ? Don't highlight a horror story and scare testers if you cannot give us a straight answer. Also we are taught in our training that there are NO subjective opinions . If this is wrong you need to correct the people who are training us as they are clearly wrong. i totaly agree, yet another grey area, that not a grey area when it suits, i think you can get the general idea about the feelings of testers is not great, Andy is quite correct, we are not structural engineers, wasent it the same with coil springs, that if it was broken and in your opinion it wasen't going to affect the vehicle you could pass it, then that was removed. What realy concerns me is you can fail a towing socket, for insercurity then hang a 28 foot caravan on the back and have shockers that have no damping affect, and because its not leaking its ok how stupid is that.. It makes me howl, if they make a comercial variant eg a Discovery 2 van ... fit pretty much what you like. If it has seats in the back it has to be an approved design. I bought an approved drop plate, but could have made my own as its a commercial. Seems a bit odd! As for the one in the photos ... seen and fitted worse with type approval. The rangerover detachable for example, famous for losing the ball when least expected. The guy will prob just unbolt it for mot and bolt it back on afterwards anyway. It's not insecure so it's a pass and advise. DVSA have told us countless times that it's a minimum standard test and we cannot judge, for example, the method of attaching a towbar. It's implying that testers should fail this particular towbar. Where's the RfR? MOI 2. Check the towbar assembly is attached to the vehicle structure using mountings, supports and fixings of an appropriate size and type. RFR 2. Towbar assembly is attached to the vehicle structure using a mounting, support or fixing which is obviously of an inappropriate size or type. I wouldn't like to pass it. Wonder if I could add this to my quota of annual training. I would have failed it due to how poorly it was secured or not.